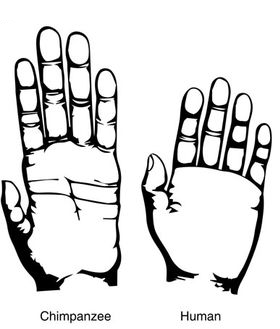 Why did the human hand evolve? The human hand is kind of a big deal. As I’m sure you’re aware, it facilitates many activities crucial for our survival. Unfortunately, that also makes it difficult to study. After all, how can we narrow down which of these many functions drove its evolution? New research, however, is getting one step closer to the answer. Scientists from around the world tested how actions carried out by our early ancestors impact the hand1. This revealed one behaviour in particular likely had a big impact on its evolution: smashing1. Humans and chimps split around 7 million years ago. Since then, our hand has evolved a fair bit. Initially, our ancestors likely had lovely long curved fingers; much like modern apes. These were great for climbing as they could hook onto branches; but less useful for tool use2. See, a big component of object manipulation is touching your thumb to fingertip in a pincer-type grip. That’s pretty hard when you have really long fingers, and is one of the reasons chimps can’t make tools as deftly as us3. In fact, when chimps try to make stone tools they don’t like doing it like humans (and our ancestors). Whilst we hit one rock with another to break off a flake in a controlled manner, they’ll just chuck the whole lot at a wall until the piece they want breaks off4. As such, it should come as little surprise that our hand soon changed. Or maybe, we never even had chimp-like fingers to start with2; but that’s a story for a different time. The fact remains that between 2-3 million years ago, our hand had become recognisably human. The big change here is our short stubby fingers, which are much better for making the pincer grip with. 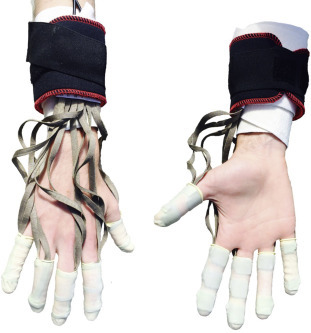 Accordingly, our fingers are a bit more robust to deal with the added forces of the pincer grip and provide a bigger point of contact for the thumb6. Armed with these adaptations, our ancestors could get to work making stone tools. The rest, as they say, is (pre)history. So, our hand seems to have changed over the past few million years. And that change seems to be linked to tool use. But that’s a fairly broad topic. What, in particular, was involved in our hand’s evolution? To investigate this, researchers from around the world conducted a series of experiments on humans. They got them to carry out various stone age activities with pressure sensors on. Things like making stone tools, using them to prepare food, and so on. This allowed them to see which were the most demanding on the hand1. A study into evolution, or primitive cybernetics? This revealed that the most demanding behaviour early hands carried out was smashing something hard with a rock1. For instance, using a rock to break open a bone to get out that juicy marrow. Or using that rock to break another rock into smaller pieces to use as tools. Interestingly nuts, whilst hard, aren’t tough enough to necessitate the high levels of force seen in bones and rocks1. The fact that these behaviours exert the strongest forces on the hand suggests that they may be a big reason our hand evolved the way it did. In particular, the increasing robusticity of our fingers and thumbs seem likely to be an adaptation for this behaviour. Of course, the story isn’t quite so simple. There are still many questions we have about the evolution of our hands. As I hinted at before, some suspect they may not have changed that much. 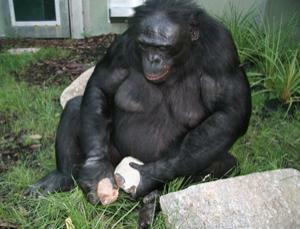 Instead, they argue ancient hands were like our own and it’s the chimps who have been evolving weird fingers2. Depending on how these questions are resolved would impact the reliability of this research. If it turns out our hands didn’t evolve much then there’s little left to explain with smashing! But if these results do pan out as expected, there are some very interesting implications. 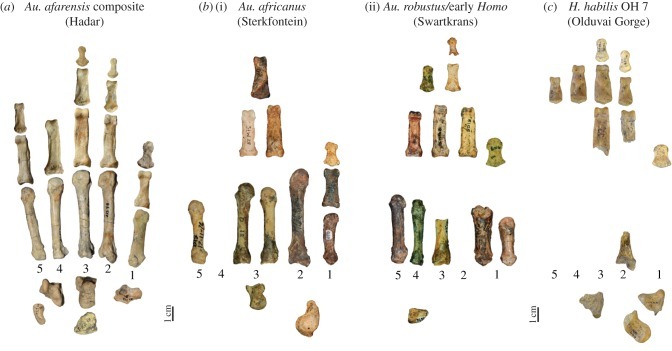 Notably, the shift to the human-type hand seems to have started at least by the time of early ape-like humans, such as Australopithecus and Lucy6. So it might be the case that these early humans were regularly smashing stuff with stone. Perhaps that is the reason their lineage took off, and humans ultimately became so successful. Williams-Hatala, E.M., Hatala, K.G., Gordon, M., Key, A., Kasper, M. and Kivell, T.L., 2018. The manual pressures of stone tool behaviors and their implications for the evolution of the human hand. Journal of human evolution, 119, pp.14-26. Almécija, S., Smaers, J.B. and Jungers, W.L., 2015. The evolution of human and ape hand proportions. Nature communications, 6, p.7717. Ambrose, S.H., 2001. Paleolithic technology and human evolution. Science, 291(5509), pp.1748-1753. Schick K, et al. Continuing investigations into the stone tool-making and tool-using capabilities of a bonobo (Pan paniscus) J Archaeol Sci. 1999;26:821–832. Roffman, I., Savage-Rumbaugh, S., Rubert-Pugh, E., Ronen, A. and Nevo, E., 2012. Stone tool production and utilization by bonobo-chimpanzees (Pan paniscus). Proceedings of the National Academy of Sciences, 109(36), pp.14500-14503. Kivell, T.L., 2015. Evidence in hand: recent discoveries and the early evolution of human manual manipulation. Phil. Trans. R. Soc. B, 370(1682), p.20150105. Presumably, skeletal changes to the human hand evolved “hand in glove” with changes to the brain to do with motor control. These hands of ours can throw projectile weapons hard and extremely accurately. They can also sew tiny beads through hand-woven cloth or process grass seeds to sprinkle on a freshly cooked kill. And all manner of skills in between. I suspect that all these benefits acted together to drive the hand’s evolution rather than any single one.